Carl Jenkinson has been impressive for the gunners this season in every match which he is called in for but Unai Emery still leaves him out of the squad to start Stephan Lichtsteiner. 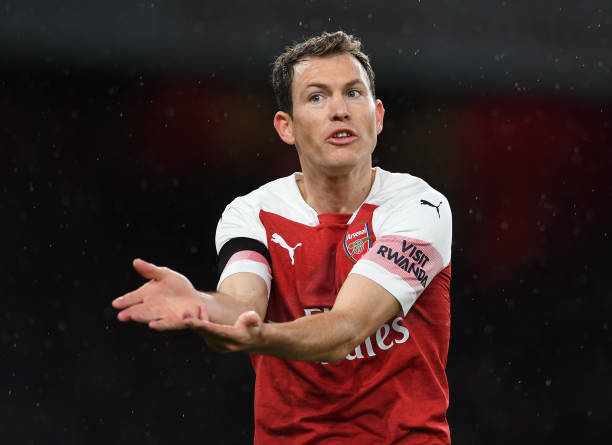 Stephan Lichtsteiner joined Arsenal on a free transfer in July and they were hoping that the Swiss international would bring his experience to the Premier League this season. The 35-year-old has been awful and made errors which have led to them dropping points in some matches. Carl Jenkinson is Unai Emery’s other option but he is mostly sidelined by the coach to start Stephan Lichtsteiner so let’s take a look at why the Swiss international is favoured. Stephan Lichtsteiner was an outstanding player in the last five years but he is now very old and the intensity of the Premier League has given him a hard time since most wingers are usually faster than him, for example on Sunday; The Swiss international failed to contain Sterling who kept giving the gunners a hard time. It is pretty understandable that the Arsenal coach would prefer experience more even though the gunners are usually let down by Stephan Lichtsteiner. It’s not only the fans that do see that Stephan Lichtsteiner makes mistakes but Unai Emery also knows this as he benches Stephan Lichtsteiner when Ainsley Maitland-Niles is fully fit but the youngster is also not good in the right back position. Carl Jenkinson is better defensively for the gunners because he got the pace and this was seen in Arsenal’s match against Cardiff City. He was impressive in the few minutes he got but it seems Unai Emery has low belief in him hence not giving him a chance in the Premier League but he really deserves to get a start. Please to management of our club Arsenal, I request that there is a problem with our defence please do something and stop Rumours of transfers be serious.